Titan Machinery Inc., which runs construction and agriculture equipment store,s raised its full-year guidance for revenue and earnings per share earlier this week. Its fiscal second-quarter profit more than doubled as all three of the company’s businesses posted revenue growth. Net income for the three months ended July 31 jumped to $3.3 million from $1.4 million a year earlier and revenue surged to $134.9 million from $85.8 million. The stock has been holding up rather well despite the weakness in the current market (Thursday aside). Its relative strength rating is within the top 1-2% of all stocks trading and the EPS rating is in the top 1% of all stocks trading. 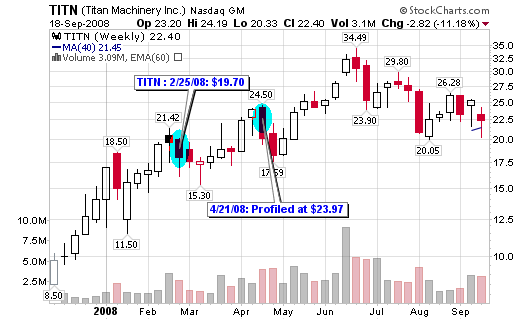 Overall, TITN is a stock that I wouldn’t mind adding shares here at the long term moving average. Disclosure: I do own shares at this time. I have been away for the past few days but IPI and TITN continue to make new highs. The two stocks are up 49% and 69% respectively.